A few weeks ago my friend Jen, from Sunshine Greetings (she guest posts here often) had a birthday. I went to her house a day early to help her get ready for the party. One of the things we did was to decorate this cake. She was inspired from a couple of articles in Better Homes and Gardens. She made a four tier cake, similar to what is seen here, but she used a lemon mix and a strawberry mix. I had a friend tell me just the day before I went to help her out that if you use 12 oz of soda and the mix.that.is.it. Jen made a "glue" of powdered sugar and water. Once you cut the marshmallows they are moist enough for the colored sugar to stick to them. We each had a pair of scissors to cut the marshmallows with. Jen also had a partial bag of green tree and pink star marshmallows left over from Christmas. The green tree marshmallows were PERFECT for the leaves. The pink star marshmallows made perfect petals for the smaller pink flowers. We cut these marshmallows in half from their sides, pinching them on one end prior to dipping the green ones into the green sugar and the pink ones into the pink sugar. For the large pink flowers I cut the large marshmallows into slices, if I recall correctly it was 5 slices per marshmallow. Prior to dipping them into the pink sugar I pinched them into an oval shape and set them onto waxed paper. Jen started cutting the small marshmallows on an angle and dipped those into the blue sugar, then set them onto the waxed paper. According to the instructions we were supposed to "glue" the petals to a large white chocolate drop (or something - I honestly to not remember - whatever it was... we didn't have it.) So... we used marshmallows! We had two and a half bags of them... what the heck! :) Once cutting the pink marshmallows they could easily be reshaped and flattened. We used these to glue the larger marshmallows to... and as the centers for the larger pink flowers. Then putting some "glue" on top of the centers we added some sugar pearls. For the blue flowers we used a cut piece of the white marshmallows to use as the base to "glue" to. We then added "glue" to the center and added sugar pearls. When using the stars to form flowers we pinched one peak so they would fit in the centers easier. 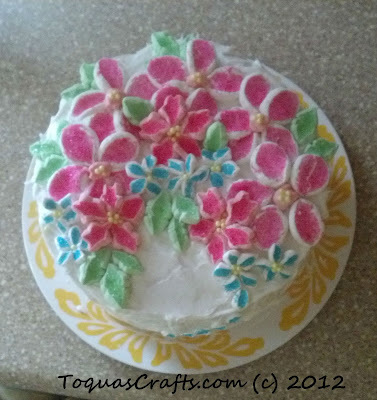 I frosted the outside, using an upward motion all the way around, and then I did the top of the cake. 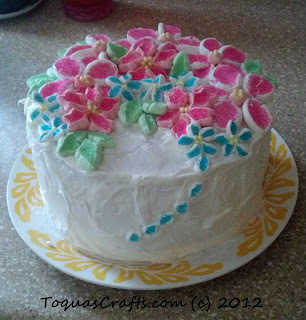 I then started placing the flowers onto the top of the cake. There were some blue petals left over so I put them down the one side (you can see them in the top photo). Happy Birthday Jen! 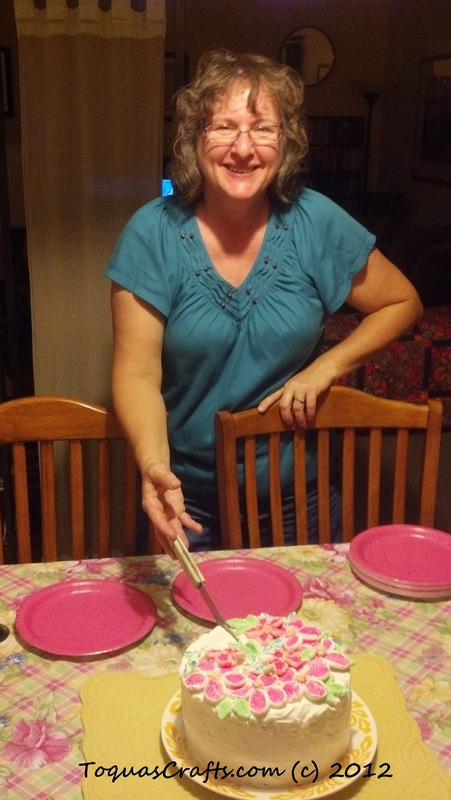 Thank you for letting me help you with the decorating of your cake and enjoying your party with you. Thank you for allowing me to share this on my blog. marshmallows? who'd a thunk it? so pretty! I bet it was yummy too! What a great idea! That looks so professional. Love it! And I never thought to use marshmallows like that! Thanks for the idea. Wow, very pretty! I bet everyone couldn't wait to dig into it. Thank you so much for sharing at Etcetorize this week!